buds. 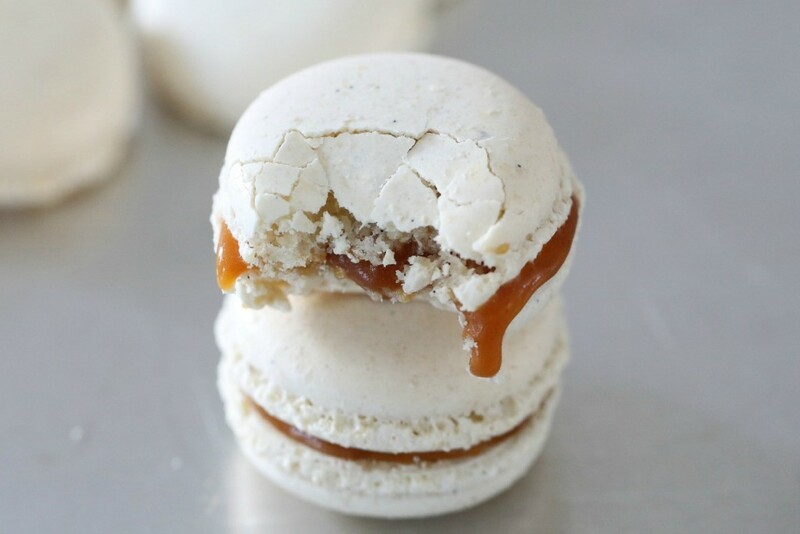 My favorite filling for the plain vanilla macarons is Salted caramel, it is just heavenly. 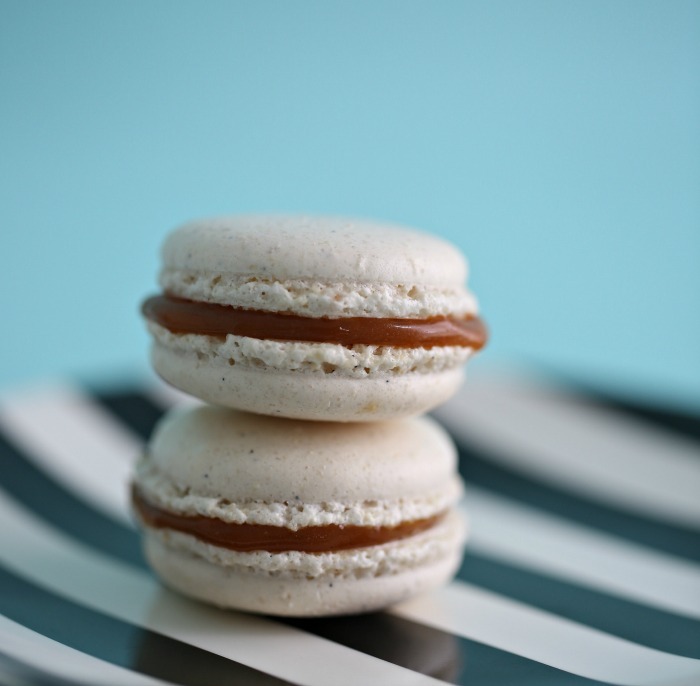 Watch the video below to see how I make these macarons and get inspired. Preheat the oven to 275°F (135°C) use conventional setting. Put half the egg whites into a mixing bowl and attach the wire whisk to the mixer. Put the sugar and water into a small saucepan over medium heat. Stir carefully with a spatula or wooden spoon until the sugar has dissolved. Stop stirring as soon as the sugar has dissolved. Remove the spatula and bring to a boil. Place a candy thermometer into the saucepan and cook until the syrup reaches 235°F (113°C). Start the mixer with the egg whites and whisk on high speed. mixing bowl with the egg whites. Continue whisking for about 7-8 minutes, or until the bowl no longer feels warm to the touch. Meanwhile, mix together the very finely ground almonds, powdered sugar, and the remaining egg whites. Make sure everything is well blended. When the meringue is done mixing, stir a spoonful into the almond paste to loosen the texture. Fold in the remaining meringue. It’s important to fold carefully to avoid losing too much air. Use a rubber spatula or large metal spoon to “lift” and fold the mixture rather than stirring it. Transfer the mixture to a piping bag fitted with a wide circular tip and pipe flat circles onto a macaron silicone mat, or a sheet of baking parchment. Check regularly after 12 minutes. 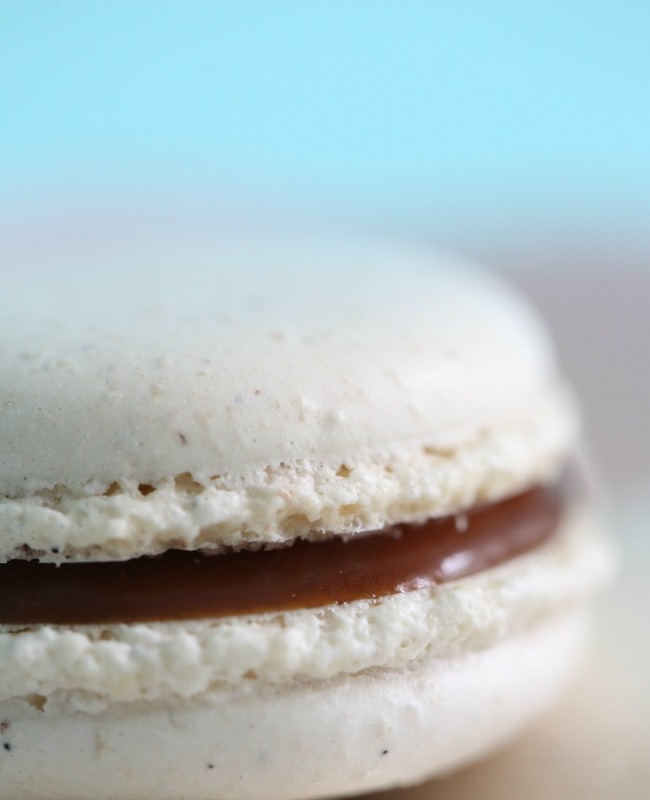 Touch a macaron with your finger to see if it’s done. The surface should be dry and firm to the touch. The macarons should not change color or brown while baking. If they brown you may need to adjust the temperature in your oven. Stop stirring and turn up the heat to high. Boil until the color has turned a deep caramel, then remove from the heat. Add the cream, vanilla, and salt and stir until well blended. Let cool completely and store in the refrigerator until needed. 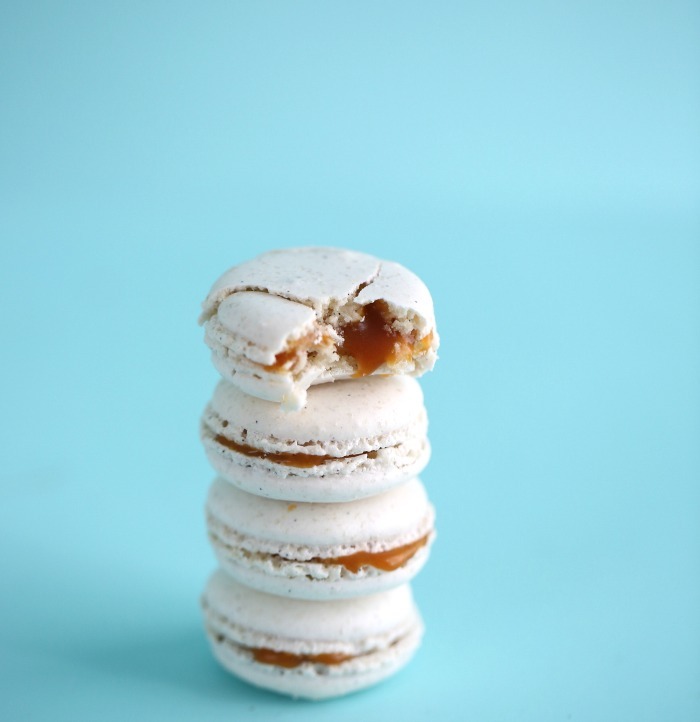 Transfer the caramel to a piping bag fitted with a circular tip and pipe a dot on to half of the macarons. can i use an oven without convention? Can i use hand mixer?i have not stand mixer. Do you have any recepie for salted caramelmousse?